The Patriot: The New Barisan Nasional: Affirmative Leadership, People’s Government. The New Barisan Nasional: Affirmative Leadership, People’s Government. Exactly three years ago today, the Right Honourable Dato’ Sri Mohd Najib Tun Abdul Razak was sworn in as the Sixth Prime Minister of Malaysia. 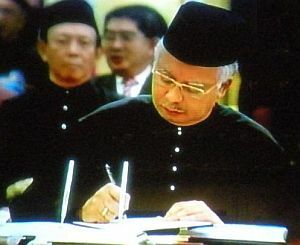 Like his father, the late Tun Abdul Razak (fondly known as “The Tun”), he got down to work immediately upon returning from the oath-taking ceremony. Najib took steps to take this country forward by creating a National Transformation Policy, which included the Government Transformation Program (GTP) and the National Key Result Areas (NKRA), which came under it. Also introduced was the Economic Transformation Program (ETP) with 12 National Key Economic Areas (NKEA) and 131 Economic Entry-Point Projects (EPP) of which in unison, we have seen and will continue to see great success as reported yesterday by the Honourable Gentleman himself straight to the Rakyat on National Television. 1. People’s Aid (Bantuan Rakyat 1Malaysia) – RM 500 each to 4,000,000 families earning less than RM3,000 per month. 2. RM 100 each to every primary and secondary student as school assistance numbering 5,300,000 pupils. 3. RM 200 worth of book vouchers to students in tertiary institutions and sixth formers numbering 1,300,000. 4. 7-13% salary hike for 1,400,000 civil servants benefitting more than 4,000,000 dependent Malaysians. 5. An announcement on a minimum wage to be implemented for the private sector will be announced this month’s end. 1. Kedai Rakyat 1Malaysia where prices of goods are a generous fraction lower than normal stores. People can usually save up to at least RM50 per time on a weekly shop of groceries. 2. 1Malaysia Clinic nationwide where sickness can be addressed quickly and cheaply. 3. 1Malaysia’s People’s Menu where participating restaurants serve quality lunch at RM4 and breakfast at RM2 for the rakyat. 4. 5 year freeze on toll hikes in the North-South, and East Coast Highways and the scrapping of toll on several passes like Cheras-Kajang and Connaught Road. 1. 1Malaysia Housing Scheme (PR1MA), to build medium cost housing in urban areas and increase housing projects for the poor. 2. RM300,000,000 has been put aside for the Fishermen Special Housing Fund for restoration of their old houses and building of the new . 3. Maintenance of the subsidy in important essentials like rice, sugar, cooking oil, wheat, as well as commodities like petrol, diesel and cooking gas. 4. Subsidy for electricity for 1,000,000 homes under RM20 per month in power bills. 1. Increased the number of police personnel in “hot” areas has resulted in the decrease in street crime by 39% while the overall crime rate has decreased by 11% since 2009. 2. Forged a co-operation between the Armed Forces and the Police Force in using each other’s training centres for cost efficiency and better service to the people. Also roped in to help curb crime are the Rela and Civil Defense Department. 3. Closed-Circuit Televisions will be widely installed. 1. Primary and Secondary education is provided free for the first time ever. 2. Teachers are recognized for their service with the introduction of the time based teaching career path to compliment and expedite their enhancement to reflect and achieve their potentials. 1 Almost 1,000 km of roads have been constructed. It is the most in kilometres done in two years in the history of this nation. The building of these roads, were with the help of the Armed Forces in East Malaysia. 2. 27,000 rural households have got electricity.
. More than 70,000 households have access clean water. 1. The light Rail Transit System will see an increase of coach trains from two to four and the extension of the Kelana Jaya-Ampang Jaya lines effecting 500,000 commuters daily. 2. The Keretapi Tanah Melayu (KTM) commuter services will be enhanced with the purchase of new coaches and this will affect 100,000 commuters daily. KTM is also completing the double tracking and the electrification of the northern routes. 3. The Bus Expressway Transit has also been introduced and will serve 370,000 users everyday. 44,000 households involving almost 250,000 Malaysians have been removed from the “hard-core poverty” category and effort is continuous in seeing that it is eradicated. 1. The effectiveness of Malaysian Anti-Corruption Commission is being further enhanced. 2. A special court has been set up by the government to speed up corruption cases. 3. Over 900 convictions have been realized regardless of creed or stature so far.
. A report by the World Economic Forum saw Malaysia improve by five notches in the World Economic Competitiveness list since last year.
. We are among the 21 most competitive countries in the world. World Bank’s “ Doing Business 2012” report records Malaysia as the 18th easiest country to start or operate a business above German, Japan Taiwan and even France.
. Malaysia is top ten in the Foreign Direct Investment Confidence Index for 2012.
. Our Per Capita income rose by US$3,000 in two years.
. Foreign Direct Investment increased by 12.3% to RM33,000,000,000. / Private Investment was up by 19% to RM94,000,000,000.
. 313,000 new jobs will be created. 1. Abolishment of the Internal Security Act, the Restricted Residence Act and the Banishment Act. 2. Amended the University and University Colleges Act to allow students the freedom to join political parties of their choice. 3. Amended the Printing Presses and Publications Act to cancel the annual license renewal. When We Make Promises, We Deliver. Much Has Been Done To Improve The Situation Of The Country And Most Importantly The Lives And Wellbeing Of The Rakyat. This Is All Done On Top Of The Nationwide Walkabouts While Listening To The Beat Of The Mass. The Writing’s On The Wall. This Is Where The Rakyat Can Be The Jury And Judge At The Same Time. This Is Where The Rakyat Can Separate The Men For The Boys; An Organized Leading Government With A Serious Leader From A Disorganized Whining Ensemble With A Questionable Unelected One. We Should Place Our Emotions Aside, Be Rational And True. The Time Is Near. We Must Be Ready To Choose The Party That Can Best Represent Us And Maintain Our Harmonious Multiracial Country In Order For Us To Continue To Flourish And Prosper Together. Experience And Competence Has No Substitute In Managing The Future Of Our Nation. In The Beginning Of Our Democratic Life, We Could Afford To Make Mistakes For We Knew Not Of What Was To Become Of Our Future. It Is Generally Understood That When We Start From The Bottom And Have Not Gone Far Up, It Is Not A Hard And Long Drop If We Were To Fall. But Having Gone This Far And High Up In World Economics Enjoying A Peaceful Democracy And Reasonably Comfortable Life In Co-Existence With One Another, Taking A Crucial Gamble Could Be Detrimental And Possibly Inflict Irreversible Damage To Us All For The Rest Of Our Remaining Lives. We Are The Country. We Will Deserve Who We Elect. Let Us Deserve The Best And Be Served Right. The Writing Is On The Wall. The Uncountable Deeds Have Been Performed And Executed With Precision In A Little More Than A Thousand Days In Office. Give This Honourable Gentleman A Few Thousands More, And Watch The Positive Transformation Of Our Country Happen In Record Time Allowing Us All To Reap The Gains Of Our Concerted Endeavor In Our Very Own Lifetime. I never missed to read your quality articles with highly form of languages. You're the man at your class. Congrats. His Excellency Najib Razak is one of the best breed of Malaysia Premiership. He speaks well to the International audiences, emotionally address to his raya by listening deep to their beat and a loving husband and father to his own family. The way how you describes in your latest article shown that Najib should be untouchable caliph because of his all rounder concern for the Great Malaysia. This is the first time I read your article with a quote from Islamic Scholar and our holy Prophet Muhammad. The relational re so good and I can see you are not only the loyalist to The Razak since your dad's old days but you're putting your soul in the Name of Razak's eldest son. Please continue to become the barbarian of UMNO and don't let ever it down and fall to the ground. You're a man that His Excellency should watch out to become the last warrior to hold the holy flag. The notion of a "hundred days" is an artificial creation of Franklin Roosevelt after he became president in 1932. Since his fabled “Hundred Days,” it has become part of Malaysia’s political benchmark for media and the people to measure and gauge leadership performances and rakyat’s needs are delivered. When our PM and ministers make their entrance to the Perdana Putra, they have approximately 100 days to show what they are made of, then 1000 days to stamp leadership accountability. The term is more than symbolic; it has become a standard indicator for evaluating the success of a leader. Looking at our PM’s 1000 days as compared to the US President’s, clearly we have soared in many ways, from travelling the nation, to enduring conflicts within and abroad, to advocating crucial bills! PM’s leadership style adorned strength and perseverance. In its entirety, though our PM can’t swing soul in Al Green’s song like the US Presiden but he can surely score double eagle in his 1000 days as PM!